The full ingredient list and instructions are over here. In this post, we’ll walk through each of the five steps together. You need to roast three ingredients (2 small tomatoes, 3 tomatillos, and 1/2 yellow onion) on a baking sheet in the oven under the broiler. The goal is to get the ingredients nice and soft and a little charred, without being completely burnt. So slice the tomatoes and tomatillos in half and place them skin side up on the foil. Then slice the onion in rings and place them on the foil, too, as pictured below. Then put the baking sheet under your broiler on high. When they do, pull out the baking sheet and set it aside. To do this step, you need a large saucepan and plenty of olive oil. The goal with this step is to enhance the color and flavor of nine ingredients by toasting them in hot oil. Soft and golden is what you are going for, not burnt and crisp. The nine ingredients to fry are: the three types of chiles (stemmed and seeded), raisins, tortilla squares, garlic cloves, plantain slices, pumpkin seeds and sesame seeds. Fry the chiles about 30 seconds a side. The chiles will turn a lighter color as they cook, and that is what you are going for. Work in batches with the chiles, about 3 at at time. Fry the raisins for about 30 seconds, stirring frequently, just until they puff up and begin to turn a lighter color. You may need to add more oil as you go from ingredient to ingredient … so just pour in a tablespoon or two if the oil starts to get low. Fry the corn tortillas until lightly golden, about 30 to 45 seconds, stirring frequently. Fry the garlic cloves and plantains until lightly golden on both sides, about 1 minute, tossing frequently. Fry the pumpkin seeds until lightly browned as well, stirring frequently. I threw my sesame seeds in with the pumpkin seeds after frying the pumpkin seeds for about 30 seconds, and then fried them both for about 30 more seconds. You can do that or fry them separately. In either case, a light golden to light brown is what you want for both. Okay frying is done! Now it’s time to move onto the soaking step. Yum, right? Okay maybe not yet. Not much explanation needed here: Just dump everything into the jar of a blender and blend on high until the mixture is completely blended and smooth. If you have a small blender jar, you may need to work in batches. Okay now for the last step. Stay with me people. Hold the sieve over a large Dutch oven and pour the blended mixture, about 1 cup at a time, through the sieve. Use a rubber spatula to press the mixture through the sieve, and add a little chicken broth to thin the mixture as you go. After you press the mixture through the sieve, you’ll see some solid pieces in the bottom of the sieve. Use your rubber spatula to scoop out and discard the solids, as these will clog the sieve and prevent the remainder of the mole mixture from passing through. All you have to do now is put the mole on the stove over medium-low heat and let it cook a little longer, about 5 or 10 minutes, stirring often. This extra cooking will deepen the color and flavor of the sauce, and thicken it a bit, too. If the sauce becomes too thick, add more chicken broth or water to thin it out again. Taste and adjust salt as needed. And that’s it!! 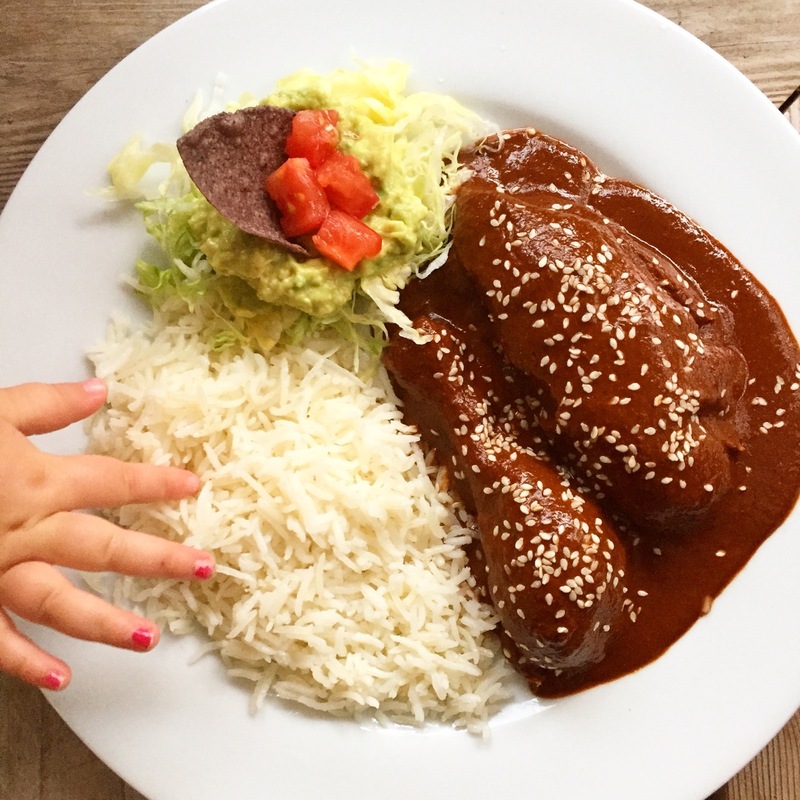 In less than an hour you’ve whipped up Mexico’s most famous sauce, the elusive red mole. Que bueno, mi amigo, que bueno. Now you can pour it over whatever you wish … from chicken or turkey (baked, boiled, grilled, or smoked) to cheese enchiladas to big beef short ribs. Garnish with sesame seeds and serve with perfect white rice or Mexican red rice. Oh, and another beer. Of course another beer. Do you have any questions? Did I leave something out? Let me know in the comments and I will get back to you as soon as I can! Thanks so much for following along. I hope you get a chance to try it! And don’t forget dessert! Here’s an easy recipe (with step-by-step instructions!) for the BEST Mexican flan you’ve ever tasted. Promise. What an appetizing post, Marie. Funny, too. Thanks for sharing it. Can’t wait to try this as I love a great mole. An ingredient list would have been nice. Hi there! So glad you are going to give it a go! The ingredient list is on a separate page; sorry for the confusion!